11:00 a.m - 4:30 p.m.
Family owned since its founding in 1961, Heitz Cellar continues to consistently craft outstanding Cabernet Sauvignon, sourced from our estate vineyards throughout the heart of the Napa Valley. Originally established by the Heitz family, since 2018 the winery’s enduring legacy is preserved by the Lawrence family, who take pride in upholding Heitz Cellar’s dedication to quality, integrity, and joy of winemaking. We are delighted that people around the world recognize the Heitz label as the symbol of classic, quality wine. We strive for the ideal balance between science and nature's bounty that ensures our wines reflect the true character of the varietal and express the unique geography of each vineyard. Our agricultural operation includes 425 acres of vineyard located in six appellations throughout the Napa Valley. All of our vineyards are organically farmed; the majority are certified organic by California Certified Organic Farming (CCOF). Opened in 2002 on the site of the family’s first vineyard, Heitz Cellar Tasting Room is constructed of native stone and mahogany as a graceful complement to nature. Our wine educators are happy to guide you through your choice of wine tasting flights, showcasing Heitz Cellar's collection of wines. Indigenous palms, lavender bushes and a mélange of citrus and other fruit trees frame an experimental vineyard which is home to numerous Cabernet Sauvignon clones. View from Tasting Room: Lovely back patio vista of surrounding vineyards and eastern hills of St. Helena. Heitz Cellar is certified under the Napa Green Winery Program by the Napa County Department of Environmental Management (DEM) and the Association of Bay Area Government’s (ABAG) Green Business Program and completed all the regulatory components needed for environmental sustainability. These components included developing water and energy conservation methods, preventing pollution, and reducing solid waste. In addition to developing sustainable winery practices, this program is set to become the standard for the state of California. 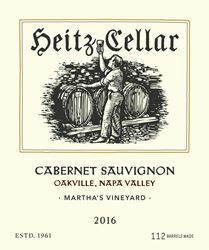 Heitz Cellar is certified under the Napa Green Certified Land Program. Heitz Cellar has created and implemented a customized farm plan with measured results that addressed all aspects of its property, vineyard land as well as non-farmed land, including practicing soil conservation, water conservation, stable drainage, riparian corridor enhancement, fisheries and wildlife habitat enhancement and long-term improvement and sustainability.